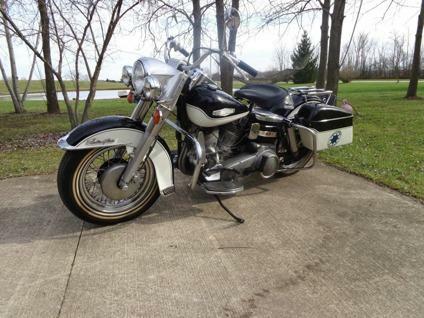 1966 STOCK GENERATOR SHOVELHEAD COPS BIKE. THIS IS A 99 % CORRECT first YEAR (four year ONLY) GENERATOR SHOVELHEAD TRUE POLICE BIKE.THIS BIKE HAS ALL ITS FACTORY ORIGINAL PARTS OTHER THAN THE TAIL LIGHT & & THE FUEL SHUT OFF TO THE BEST OF MY KNOWLAGE.IT IS AN OLDER RESTORATION WITH VERY LITTLE USE SINCE.THE ORIGINAL SPEEDOMETER WAS NOT REBUILT SO IT REFLECTS THE ORIGINAL MILEAGE.ONLY ABOUT four K MILES SINCE REBUILT. 1966 Harley-Davidson Other is a 1966 Harley-Davidson Other Classic Motorcycle in Philadelphia PA. Find other listings by searching for 1966 Harley-Davidson Other in Philadelphia on Oodle Classifieds.